At a moment when galleries look more and more like couture boutiques and temples of fashion have invaded art districts, David Hammons delivers his latest irreverent intervention, positioning it at the nexus of art, fashion, and vandalism. Hammons has not presented a solo exhibition of new works in New York for some time. After recent presentations of photocopies of images of his work (at Triple Candie) and a small survey (at Zwirner & Wirth)—both, as far as is publicly known, without Hammons’s involvement—the artist makes a sharp and sarcastic choice of venue for his return, preferring the elegant, somewhat uptight spaces of L&M Arts over the dozens of galleries willing to offer him a show. Leaving the entrance to the townhouse gallery dramatically empty, Hammons installs in an adjacent room a series of mannequins dressed in stunningly luxurious fur coats, each of a different species and fashion, all of them equally beautiful, if not slightly démodé. 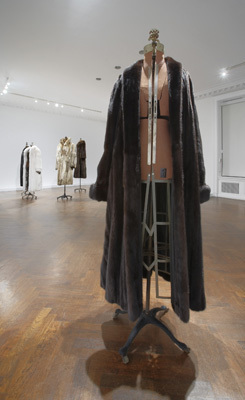 Most of the fur-clad dummies face the viewer in a strangely frozen parade that evokes the setting of an immaculate showroom, an atmosphere that is also rather funereal. The old-fashioned, headless dress forms, in fact, add a sense of inaccessibility—a temporal distance that compounds the seemingly unreal splendor. Upon closer inspection, one realizes that Hammons has carried out violent acts against these mysterious objects: While the coats’ fronts remain intact, their backs have been defaced, whether with brightly colored paint or brutal burns. Rising like totems, Hammons’s sculptures appear as powerful insignia of an indeterminate class struggle, in which the status symbols of the Upper East Side and its affected lifestyle have been simultaneously reaffirmed and attacked.